← Look What I Found…. I will be giving this lecture at Clark University and I have mixed feelings about it. The “mixed” part of my feelings comes from my complete lack of idea how to approach it. Apparently it will take place in a room where everyone has a computer and can follow along or practice different “techniques” I use. That is awesome but it means that I will have to figure out what those “techniques” actually are. As you likely know by now, I just “wing it” a lot of the time. I’ve never officially learned how to do any of the CarFreeBrad stuff I do. I just do it. So yes, I’m the Nike of the Blogosphere. 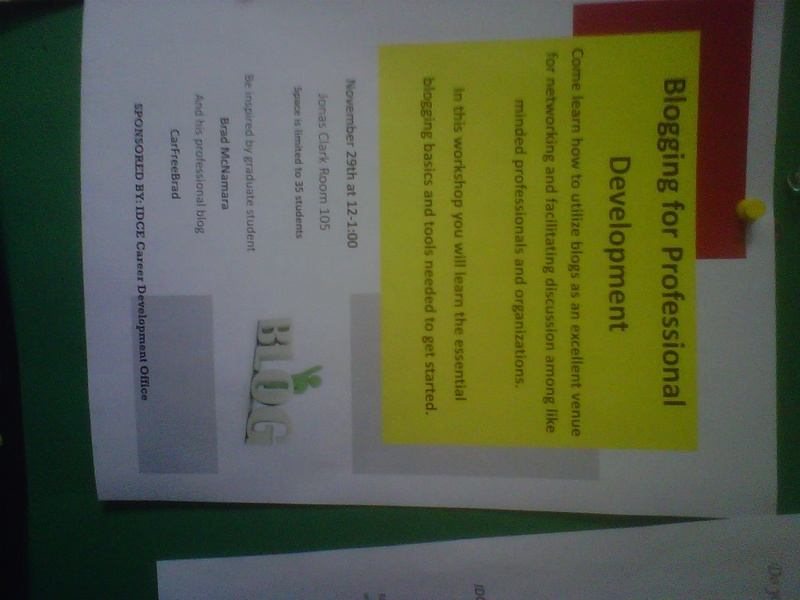 I guess my main concern is that I will be so terrible that I will singlehandedly turn an entire lecture hall full of students off the idea of blogging forever. I want to make sure it is fun, interesting, engaging….you know all that “good lecturer” stuff. Looks like I’ve got to put in some time to make sure I don’t look like a bozo! Wish me luck and if you are around Worcester on Nov 29th at noon, come watch me “wow” ’em or go down in flames. Either way, entertaining for you! This entry was posted in Bike commute, Car Free, Urban Bike and tagged Blogging, Blogposts, Boston, CarFree, CarFree Movement, CarFreeBrad, clark IDCE, Clark University, Nike, professional speaker, Social media, Worcester, Worcester Magazine. Bookmark the permalink.